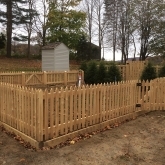 If you look at our pictures on our website, you may recognize some of the fences that you’ve seen as you drove around Redding, CT. As you can see, the company is well equipped to handle any fencing job, big or small. 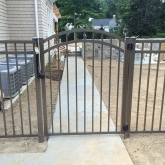 No matter what area you live in the Redding, CT area, we have a wide selections of fencing options to choose from. Many will be suitable for the area you want to enclose. 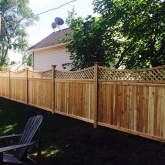 Roots Landscaping will show you the fencing options that will meet your goals for a more private, quieter and safer home or business. 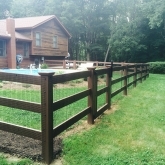 We offer the highest quality fences. 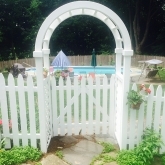 To learn more, please view the beautiful fences on our website here. After you meet with our fencing experts and select the fence that best suits your needs and location, Roots Landscaping installers will measure the area and help you choose from a wide selection and install your fence properly. Roots Landscaping has an experience repair staff that is available to help you determine the type of repair your existing fence needs. In order to save you money in the future, they will instruct you on how to keep your fence in good repair. Wood rot, decay and decomposition are common fence problems. It is normally caused by a wood-damaging fungi, which results in wood decomposition. Fencing suffering from fungi damage needs to be specially treated with chemicals, patched, repainted or stained. If the wood is too far gone to be salvaged, Roots Landscaping carpenters may be able to replace the damaged boards. Roots Landscaping is a leading contractor in the area for replacing or repairing the decaying wood. 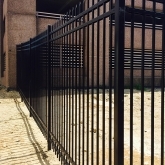 If you are not sure which type of fence you want or need, we can help. To learn more about our products, landscaping, masonry, installation teams and prices, contact us. 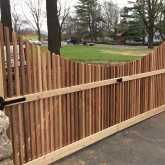 Contact Roots Landscaping today to have a fence installation and repair specialist look at your area and show you what is available that will meet your needs. 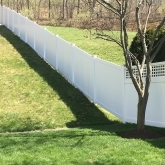 A beautiful fence can improve the appearance and value of your property so getting the right fence is a good investment. Call us today at 203-304-7326.